Posted on January 18, 2011	by Lou Murray, Ph.D. I last reported a harvest on December 6, so I have some catching up to do. I’m afraid that my new addiction to using the Wii Fitness Plus and watching movies on our new flatscreen TV with home theater sound have virtually eliminated gardening for me. That must stop, because the weather is unseasonably warm and I am really itching to get back to my garden. One of these days soon, I promise I’ll plant my winter garden. Although it’s likely to be a spring garden now that it’s gotten so far into the season. My gardening log from 20 years ago reported frost. But this week we’re having near record hot temperatures. Global weirding in action. My pink magnolia tree used to be in peak bloom in mid-January. This year it began blooming in November and now it’s almost finished. I’ll need to do a “what’s in bloom in my yard” post soon because our Florida Prince peach tree is about to burst into bloom. I’m worried that this abnormal heat will cause my fruit trees to break dormancy and that the crops will be ruined when cold weather comes back. Gardening during these times of global warming is not for the faint of heart. Our hens have finished molting and at least Chicken Little and Henrietta are laying again. But Henny Penny hasn’t laid an egg for months. Given her poor productivity through last summer and fall, I’m thinking that her laying days may be over. At least she’s a handsome hen again now that her feathers have grown back. Since Dec. 8, the hens have laid 23 eggs. I also harvested 4 Eureka lemons (10 oz. ), 3 small tomatoes (2 oz. ), and 1 oz. snow peas in those darkening days of December, 2010. But by now, the tomatoes have all bit the dust, so to speak. They were looking pretty dead, and although they will grow back from the roots in these parts, I pulled them all up. 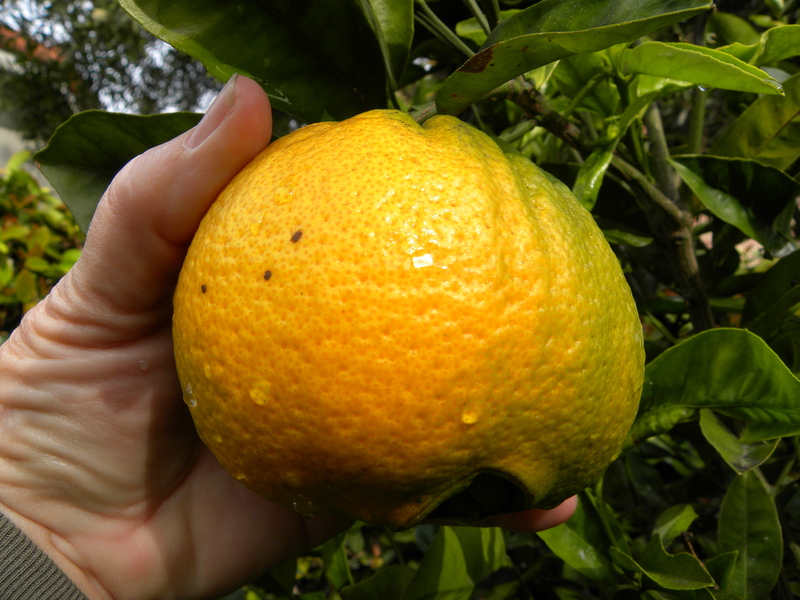 Our citrus crop of oranges, lemons and limes is looking good this year. Because my harvests are definitely sub-par this time of year, I’ll combine the first two weeks of 2011 into this harvest report. The harvest includes 2 avocados, my entire crop, and yams, the first ones I’ve ever grown. I grew them in a Smart Pot. We baked some of the yams last night for dinner and they were great. Flavorful and tender. YUM. The vines were dying on my yams, so I harvested them. We got a LOT of yams, but they're pretty skinny. I'm not sure if they would have gotten fatter if I'd left them longer in the Grow Pot or not. I didn't want them to get fibrous, so I harvested them. Not a bad harvest for this time of year. We’ve had weather around 70F mark over the weekend. After 28F lows, and more rain than I care to remember in November and December, I’m glad for the sunshine, but I’m afraid our fruit trees are going to get awfully confused! Clare, I know what you mean about crazy weather and fruit trees. My Florida Prince peach is in full bloom. I hope a cold snap doesn’t take it out. We’ve had unseasonably warm weather ever since it stopped raining in early January. Now no rain for three weeks. 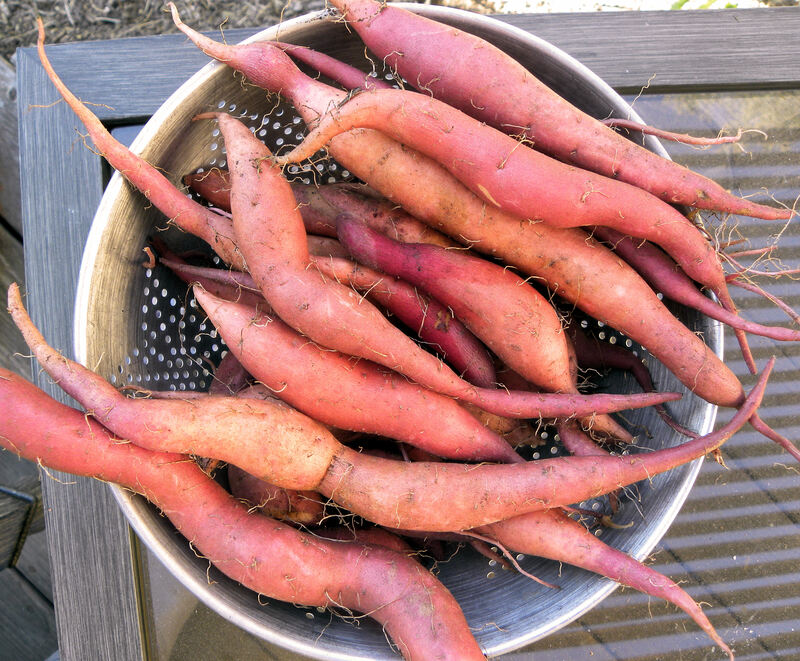 The yams are amazing – something we cannot grow in our area successfully so I always admire them from other gardens. Kitsap, I’m sorry you can’t grow yams. This was my first attemtp and while the yams were small, they’re amazingly tender, flavorful and stringless. A new flatscreen TV? What a great way to watch gardening programs! VeggiePAK, I’m afraid all I’m doing is watching movies and the weather channel. Still haven’t gotten outdoors to garden despite lovely weather. lol I know how you feel. I tend to get caught up in things too (addicted to games) and neglect my gardening. But I’ve got to get my seed starting area set up soon. I need to start my onions. Daphne, I’m really behind in transplanting onions, leeks and garlic. Never got any bok choy, broccoli, cabbage or cauliflower in. Well, it isn’t too late. But there’s always another movie on. This HD TV is blowing me away and I can’t tear myself away.